Talking Adelaide has shopped quite a bit locally in the past week - at Denim Iniquity, Country Road (Rundle Mall) DJs and Sunglass Hut - so, with that in mind, this is a guilt-free online shopping recommendation. 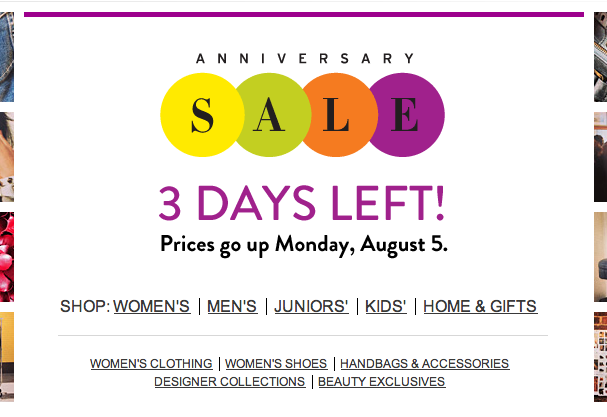 There's two (depending on your time zone) days to go in US department store Nordstrom's amazing online anniversary sale. What better way to spend a dreary weekend than couch shopping in front of the footy? There are considerable reductions on items to be had - especially in the designer section here but you don't have to spend anywhere near these prices to still get a great bargain on classic not just fashion pieces. This is a decent sale too - where current items are marked down, not just the stuff Nordstrom's can't sell or shift. Talking Adelaide has succumbed to a pair of black, suede booties (pictured below) that were 25 per cent off the usual price but could easily do damage in the handbag section. You could pick up some early buys for spring/summer or extend you winter wardrobe. Of course the sale is for guys and kids too. Even homewares. And the shipping charges are virtually nothing. As Talking Adelaide likes to say, "you have to spend money to save money". Just click on the sale image above to go to the sale site. If you have a particular designer or brand you like, search via the brand link on the homepage; the sale items are generally listed first, and there seems to be something from every brand on sale. Love to know if you pick up a bargain.